1. Abby Rocking Her Type A Presentation. While it wasn’t officially part of the ASW agenda, Abby paved the way for a great week by presenting at the Type-A Bootcamp on Saturday. Many Type-A attendees stayed on in Vegas to attend Affiliate Summit which led to many conversations and connections throughout the remainder of the conference. We knew we were in for something big when our party RSVP’s reached capacity before we even arrived in Las Vegas. This year’s party was hosted at the fabulous Heart at OMNIA nightclub and featured a killer DJ, magicians, Gatsby-themed accessories and a rip-roaring good time. It wasn’t long before the dance floor was crowded and people were decked out in the accessories we provided which included feather boas and sequin headbands. This was one to remember and will be hard to top! …spent catching up with current clients and meeting potential new ones! A hot topic of conversation was how we solve the common problem of late coupon clicks and other attribution issues with our “Conversion Lines” tool. Newer Merchants were thrilled to hear about our Guided Launch program offered through Client Services and our plans to release the Recruitment Tool in the near future. Additionally, Merchants and Affiliates alike were excited to browse through the new Spring Catalog which was hot off the presses – just in time for the conference! Our Affiliate partners were eager to share news and successes from Q4 and learn about updates to our blogger tools. 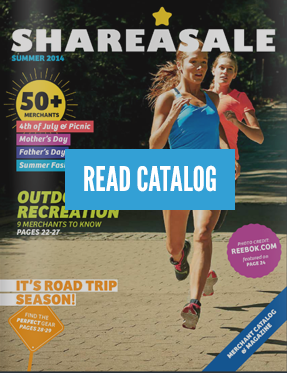 ShareASale Spring Catalog Has Arrived! The theme for this edition is Milestones. See which ShareASale Merchant programs can help celebrate life’s most important moments. Join these programs today! 4. Socializing and happy houring with some of our favorite faces. While it seems like there is no time to spare there is always time to catch up and check in with our industry friends and clients. We took advantage of the plentiful food and beverage options in Vegas and got to cheers with some of our most valuable partners! Already going through conference withdrawal? Not to worry! Think Tank is right around the corner. Make sure to register today before spots fill up. Thank you for sponsoring and exhibiting at Affiliate Summit. Love the pics, especially Stephanie’s with the ShareASale party favors having a 2nd life. We’ll see you in NYC in July.